Dr. Neil McGarvey, my friend and pharmacist, ordered a splendid new boat a couple of years ago. She’s a classic Judge Yachts Chesapeake 27 named The Gannet. It’s a deeply symbolic designation. She lives in a marina just inside the mouth of the Patuxent, and her home waters run from Cedar Point to the American Mariner wreck off Smith Island and the mouth of the Potomac. Those are broad, deep waters on the Chesapeake’s main highway, the ancestral channel of the Susquehanna. This month, flocks of the boat’s namesake bird will storm this trench, diving spectacularly en masse into schools of large menhaden migrating out of the Bay to their wintering grounds on the Atlantic’s continental shelf. And yes, Neil and Gannet will be out there too, because those menhaden will be caught literally between the big birds and large rockfish, which are capable of catching them in spectacular fashion. Neil is first a skilled angler, but November in this part of the Bay will turn anyone into an avid birdwatcher. Gannets with their white bodies and 65- to 71-inch wings-spans and dark wingtips are, in a word, magnificent. They are pelagic and seldom return to land except when nesting. They nest on the seaside cliffs of Quebec’s Gaspe Peninsula, the Gulf of St. Lawrence, Newfoundland and Labrador, and also on the west coast of Scotland and Wales. The North American gannets flow from their nesting areas down the Chesapeake and the Mid-Atlantic coast on their way to wintering waters in the South Atlantic and the Gulf of Mexico. It’s no accident that their presence here coincides with the exodus of menhaden from our Bay. They are stocking up calories at our food court on their journeys, just as the migratory rockfish are coming in from the coast for a last feast before winter. Thus, anglers like Neil tend to be the people most attuned to gannets when they are here. It’s not easy to describe a gannet storm, where flocks of noisy, large, highly visual birds hover high over the water, looking down from 90 feet high or more. When they spy baitfish, they begin to rain on the school, diving at speeds up to sixty miles per hour. Just before they reach the surface, they fold their wings, turning themselves into white-and-black, fish-seeking missiles that enter the water with hardly a splash, plunging to depths of 30-60 feet. Underwater, they “fly” with their wings and swim strongly with their large, webbed feet, which are positioned toward the rear of their bodies for maximum propulsion efficiency. They catch fish on the dive with their long, sharp, steel-gray, saber-shaped bills, swallowing the catch as they return to the surface. Meanwhile, other members of the storm continue to fall on the hapless forage. It’s spectacular and breathtaking to see. The impact forces of this feeding behavior are huge, and gannets are built to take it. A spongy bone at the base of the bill absorbs some of the force. The nostrils are located inside the bill, where the bird can close them to prevent inhaling water. The eyes are set forward, where they offer binocular vision to help the bird stay focused on a target during the dive, and they are equipped with nictitating membranes, protective extra eyelids. 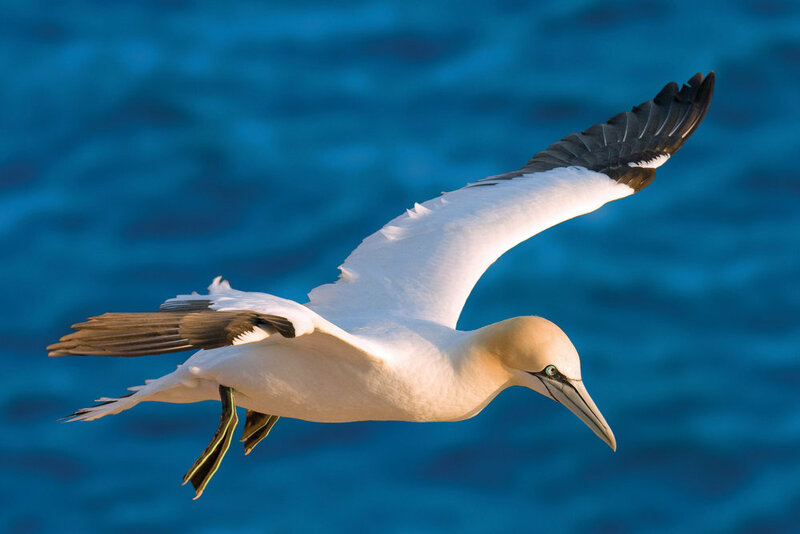 The gannet’s neck and chest have air sacs between the pectoral muscles, breastbone and ribs, which also help cushion dive impacts. The sacs are connected to the bird’s lungs so it can fill or empty them to regulate buoyancy while underwater. There’s plenty more to the gannet story, from the striking black markings around the base of the bird’s bill, which set off its gray eyes and yellow/buff head, to the complex behavior patterns the birds exhibit in their rocky northern gannetries where they breed and nest. They mature at around five years of age, and the pairs mate for life, communicating through motion and touch with their necks extended and bills pointed to the sky. Immature birds with darker markings hang around the outer edges of the colonies during nesting while parents fly as much as a hundred miles in search of food for their newly hatched young. In these far northern latitudes, the season is short, so hatchlings must quickly learn to fly by launching themselves from the cliffs—tentatively at first and gradually with more confidence while their parents continue to feed them. As September becomes October, they begin to fish for themselves, joining other members of the colony in feeding storms. When the birds reach the Chesapeake in November, the young pepper the white flocks with their darker colors. As the dense menhaden schools move out to the Atlantic, the gannets follow them and continue flying south to pursue southern forage species over the winter. Come spring, they will return, making brief appearances along our coast and in our Bay to storm the menhaden moving north. Again, rockfish will attack those baitfish from below, storing up calories for their spawning runs up the Chesapeake rivers. And anglers like Neil McGarvey will marvel at the gannet storms as they troll and jig for the stripers beneath. Together they mark the features of the Chesapeake’s changing seasons.